The service life of blast furnace is largely determined by the erosion of carbon brick. The experiments were carried out to investigate effects of sulfur and titanium interaction in molten pig iron on erosion of carbon brick. The experimental results show that the erosion of carbon brick was enhanced when the sulfur content increased separately in molten pig iron, however, this effect could be made up by addition of titanium in molten pig iron. The control standard of sulfur content and titanium content in molten pig iron was proposed, which was combined with the operation to delay the erosion of carbon brick. The quantitative relationship between the erosion rate and sulfur and titanium interaction at 1773 K was obtained based on experimental data, when sulfur content increased by 0.01%, the increment of titanium content by 0.015% would be needed to compensate for the effect of sulfur content on the erosion. 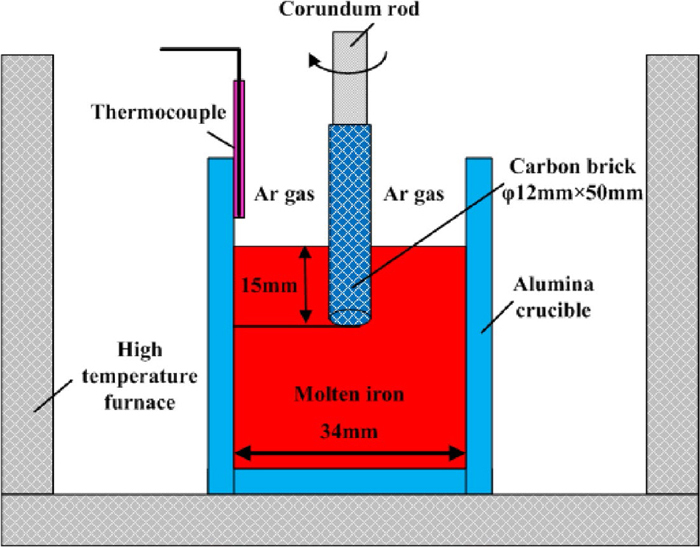 The mechanism of sulfur and titanium interaction was analyzed through the erosion process of carbon brick, the difference between the influences of two elements on the surface tension and viscosity of molten is the essential cause of the interaction.